Ten young talents who have the most outstanding research projects or solutions in science and technology were presented with the Golden Globe Awards 2018 at a ceremony held in Ho Chi Minh City on December 28. The awards were presented in the five areas of environmental technology; biological technology; medical-pharmaceutical technology; new material technology; and information technology and communications. Each winner received a Golden Globe trophy, a certificate of merit, and a cash prize of 20 million VND (880 USD). Addressing the ceremony, Politburo member and Secretary of Ho Chi Minh City Party Committee Nguyen Thien Nhan applauded the young talents, calling on them to make further contributions to the country and society. 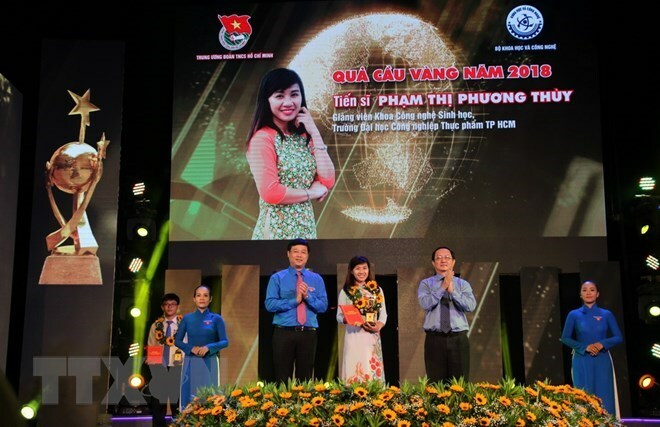 The award has been launched by the Ministry of Science and Technology in collaboration with the Ho Chi Minh Communist Youth Union Central Committee since 2003 to discover talent and stimulate a passion for technology and science research amongst young people.